Home » History » What is a real carrot? What is a real carrot? About a week ago, I was speaking to a mum and the topic of shopping in supermarkets came up. It was a wide-ranging conversation and the benefits and concerns she expressed about shopping were similar to what other mums have talked about. In summary, supermarkets are convenient, good value and make it easy to buy a wide variety of products. On the negative-side, she voiced fears over mass-produced and highly refined foods. With similar questions about what is on offer: Who knows what is in them? What do they take out? What do they put in? Like many caring mums, she’s trying to balance the time she had, the budget on hand and buying the most nutritious and healthy choices for her family. In practice, she shops a bit more sceptically by bad-avoidance rather than thinking through which choices are healthy. This is where she raised a strong interest in organic food and used, as a primary example, those dreadfully genetically-modified coloured range of carrots that are aimed at children. ‘Why can’t they leave nature alone’? Exploring this a bit further, she was basing this decision-making on colour, shape and uniformity of these intruder carrots. This is a familiar and fascinating misconception about what is natural in the world of natural foods? Raising the question was is the natural colour, shape and form of a carrot? The etymology of the word goes back to the Indo-European for horn – ker– rather than a colour. A cultivated plant of the parsley family with feathery leaves, which yields carrots. Daucus carota, family Umbelliferae: two subspecies and many varieties; wild forms lack the swollen root. They are in the culinary record going back to the Egyptians and are found through Europe and the East. From the 10th Century A.D. they are believed to have moved through India, Middle East and Europe from Afghanistan. It is believed to have started as a weed called ‘Queen Anne’s Lace’ , which is also called a wild carrot . 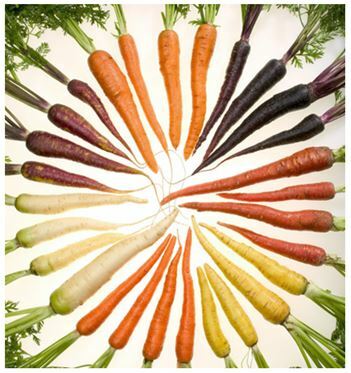 What is a collective of carrots: A rainbow is a better description than a bunch. It is often believed that today’s almost omnipresent orange carrot gains its place of presence because of connection to the Orange-Nassau dynasty in Holland during the 1700’s, where four generations of the Princes of Orange used the Dutch East-and-West Company to develop the wealth and influence of their families. The brand-colour of orange extended far beyond the selective breeding of orange fruit and was found in the colours of everything: the castles and places were named after Orange. There has been suggestion that ‘patriotic growers turned a vegetable which was then purple into the colour of the national flag’ . However, this might be overstating things; yellow and orange carrots already existed, so carrots were not ‘turned’ into anything different, just a colour variety was grown in a politically partisan harvest. This likely enabled them to play with variants to heighten the colour. So the orange carrots were favoured politically for this family but there must be more to their popularity; because as the Dynasties influence waned, Orange carrots in Holland became less-popular. While this type of carrot-eugenics did contribute to political narrative of the time but all colours of Carrots are natural. It took World War 2 to create the cultural-norm that carrots are orange. However, this context needs to be sown. In the peak of the war, most of the European nations were undergoing extreme food shortages – to an extent that is almost unimaginable to today’s supermarket voyeurs. Growing your own food was a form of patriotic duty and governmental instruction. 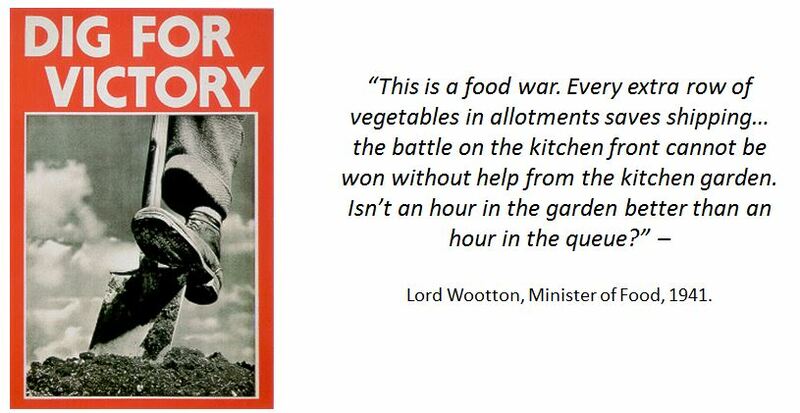 Having people grow their vegetables took a lot of pressure off the war effort and carrots are hardy weeds. There are a couple of credible explanations for one of the great wartime-myths of Carrots: that they give you better eyesight. Medically, there is some truth to this belief, carrots are a great source of Vitamin A, which is important for good eyesight. It has been suggested that the war-propaganda prompted carrot consumption so that people felt more confident during enforced blackouts during bombing raids and electricity shortages, but more likely this was a narrative that followed a more specific propaganda message. ‘A WWII propaganda campaign popularized the myth that carrots help you see in the dark. Tolarczyk is not confident about the exact origin of the faulty carrot theory, but believes that it was reinforced and popularized by the Ministry of Information, an offshoot of a subterfuge campaign to hide a technology critical to an Allied victory. During the 1940 Blitzkrieg, the Luftwaffe often struck under the cover of darkness. In order to make it more difficult for the German planes to hit targets, the British government issued citywide blackouts. The Royal Air Force were able to repel the German fighters in part because of the development of a new, secret radar technology. The on-board Airborne Interception Radar (AI), first used by the RAF in 1939, had the ability to pinpoint enemy bombers before they reached the English Channel. But to keep that under wraps, according to Stolarczyk’s research pulled from the files of the Imperial War Museum, the Mass Observation Archive, and the UK National Archives, the Ministry provided another reason for their success: carrots. In 1940, RAF night fighter ace, John Cunningham, nicknamed “Cat’s Eyes”, was the first to shoot down an enemy plane using AI. He’d later rack up an impressive total of 20 kills—19 of which were at night….the Ministry told newspapers that the reason for their success was because pilots like Cunningham ate an excess of carrots. So rather than let the Germans know the English had on-plane radar to assist in bombing, everyone was sold the myth of the magical effect of carrots on the human eyes. If you read ‘The Second World War’ by Anthony Beevor, you realise how important this deception was. As much as we’re used to the pin-point satellite drops from bombers on CNN during the Gulf war, WW2 bombing was more miss-than-hit which is why they favoured carpet-bombing so much. It was so effective that Germans have the same belief about Carrots, even though it’s an English myth – since the Nazi’s interrogated the British pilots they shot down and got the public propaganda line. However, medical research doesn’t back up these claims of carrots improving your night vision or eyesight: Various studies ‘… show that while taking vitamin A can reverse poor vision caused by a deficiency, it will not strengthen eyesight or slow decline in people who are healthy.’ This finding is supported by the Blue Mountain Study in Australia that shows that Vitamin A is important for general eye health but it does not repair or augment bad eye sight. So we know that the combination of the desire for keen-eyesight when enemies were dropping bombs on you would have been motivating, it was also the war-effort to have people being more self-sufficient in food production across Europe that was a main driver in carrot consumption. If this got people eating more carrots, the main driver of the success of the orange carrot can be found in the popularity of the Carrot Cake. Sugar was a food item that was quickly rationed as the war started. 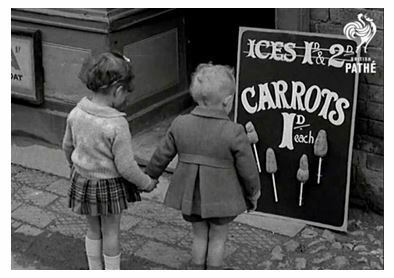 In both world-wars, carrots were used as a sweetener, as sugar was limited in supply. The Orange carrot is the sweetest variety that suited this purpose – leading to its widespread popularity. It was only in 2002 that purple carrots went back into supermarkets in the UK . In many countries this is still probably limited to organic and specialty sections. Driving this is the increasing awareness of the benefits of phytochemicals – that are richer in darker coloured red and green vegetables. This plant-compound helps the body deal with free-radicals – which ultimately can lead to life threatening illnesses. So purple carrots, cauliflower and broccoli are appearing in greater numbers on our grocery store shelves. Scientists are working with the genetics of carrots to see what other benefits they can develop. Scientists in the US say they have created a genetically-engineered carrot that provides extra calcium; someone eating the new carrot absorbs 41% more calcium than if they ate the original kind. At the same time the organic seed banks – that store seeds for genetic variety – at the University of Warwick are capturing genetic representatives of as many cultivated and wild varieties of carrots from around the world, in order to guide crop researchers and breeders in developing varieties adapted to future growing conditions . They are from the war but why so uniform? There is one aspect of the modern carrot that still need to be discussed; their shapes. Since one of the critiques of these new colourful-carrots in supermarkets is that they are all different shapes and look unnatural. Perhaps the better question should be, ‘how are orange carrots so uniform in shape and size’? One of the agricultural marketing success stories is the rise of the baby carrot. The current perception is that baby carrots are the young version of the plant. The truth is the baby carrots that we see in freezers and chillers are ‘baby style’ carrots. 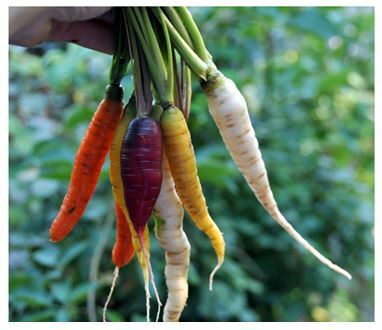 In 1986, a Californian carrot grower Mike Yurosek was tired of the carrots that didn’t match the exacting standards that make consumers think all carrots should be the same size and look, they had to be discarded. Using a bean-slicer he cut the carrots into two-inch pieces that became ‘the baby carrot’. This process was refined: “After the top and bottom are cut off, it is sliced into two-inch segments and then roughly peeled. The segments are given a final polish – a sort of carrot sanding – and then sorted by size and bagged”. Not looking back, Grimmway Farms produces 85% of the carrots eaten in the USA. Using self-propelled harvesters three workers can pick 75 tons–roughly a million individual carrots–in one hour. It’s a nearly $400 million business and growing. The success of the baby-carrot has informed our expectations of all carrots looking the same. Part of the success of the baby carrot has been its fit with feeding children at a time when healthier alternatives are a wider trend. 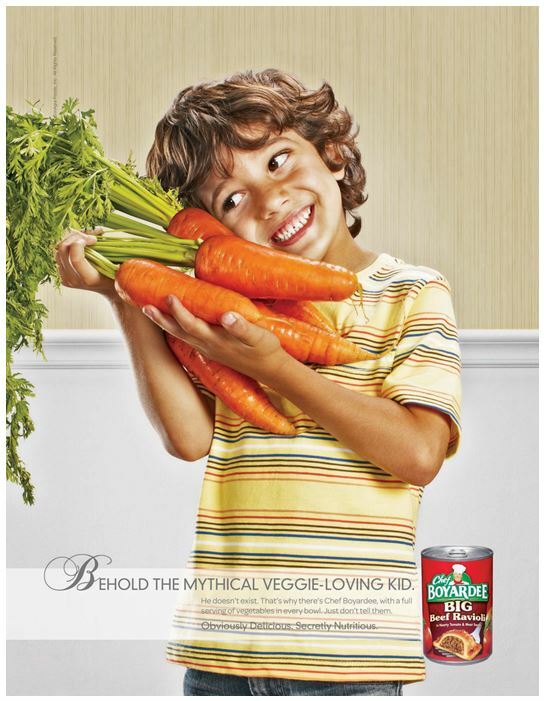 The natural sweetness of carrots seems to make them more kid-friendly. If we recall how they were used as sweeteners in WW2 – they were lollypops. The baby-carrot farmers have used some innovative marketing to generate this positive pester-power with children. Scarrots are a way of speaking to Halloween, to the positioning of ‘”Eat ‘Em Like Junk Food”. Nickelodeon and Tom-and-Jerry for McDonalds both attempt to speak to parents through lowering the barriers with children through their popularity. To be balanced, their advertising has also tried to speak to adults in new ways. Looking at the three main challenges to the wild carrot, the mum I was speaking to: colour, shape and uniformity, the opposite is actually true. Real carrots can be orange but are much more likely to be yellow, white or purple from a geographic and historical perspective. Carrot shapes are kept uniform by the human-standards – where we have ironically taken the ‘horn’ out of what ‘carrot’ originally meant, as we now favour straight-shapes of uniform size. Furthermore, this uniformity has been industrialised – it is man-made perfection rather than being Mother Nature’s handiwork. It will be interesting to see how our supermarket shelves change as the trend for preferring wild heirloom varieties takes root further. This Second World War history is a considerable investment of time, but if you want a detailed and comprehensive guide through the history of WW2 it’s an invaluable resource – Anthony Beevor has accomplished an amazing task at keeping a lively history through some complicated and often dark times. I belatedly found the World Carrot Museum after writing this blog – it’s one of those amazing internet sites that demonstrates passion and erudition for a topic. Well worth a visit.